In Seattle, the seagulls are freakishly huge, the homeless call me ‘Ma’am’, and the sunsets are incredible. I have taken to buying something extra when I go to Safeway, which is the neighbourhood grocery store. There is always a homeless man standing outside, asking for change – and it is never the same one. I have grown tired of avoiding their eyes, because, quite honestly, I don’t like ignoring a human being who has spoken directly to me, but I do not want to give money to every homeless person I see either. In Seattle, it is an unfortunate thing to say, they are everywhere I go. More so than any other city I have spent time in, and they are unfailingly polite, “Excuse me, Ma’am, could I please have some change for some chowder. I love chowder.” Today I met this man’s gaze and said, “I have bananas I can give you.” He smiled, “I love bananas too. Thank you,” he said as he tucked them into his coat. I had bought the bananas with this interaction in mind. There was no homeless man standing outside Safeway when I went in, but as I had figured, he was there when I came out. I just didn’t want to be empty handed. I will have to go back to the store tomorrow for bananas, but they don’t mean the difference to me between eating tonight and not. And I am mindful that the cold, although quite a bit colder here than I am used to in Sydney, disappears when I walk through the doors of our centrally heated apartment. I just feel particularly fortunate here, and like I can do a little thing for someone. I had been warned about the number of homeless here by a friend who recalled it as a stand out feature of the city. I just forgot about it, until I arrived and was confronted with it daily. What am I supposed to do? The etiquette escapes me, as I do not encounter the homeless on a daily basis back home. Fortunately, Seattle has much more to offer than the sad faces of cold and hungry men and women, although, it is not outstanding coffee, but I have already covered that. The seagulls here freak me out a bit. They are huge, and strangely compelling in their hugeness. I naively asked a local, “What type of birds are these?” She smiled at me rather oddly, and simply said, “Seagulls.” Okay, so when I say that they are huge, I mean it; the wing span of some is over a metre. I think that qualifies as ‘huge’. If one of these gulls was diving for my chips as I sat on the beach, I would recoil in horror, go indoors, abandoning said chips without a second thought. We were quite mesmerised by these Uber-gulls in flight the other day. Ben (my boyfriend who is currently working in Seattle while I am a lady of leisure) and I hopped a ferry out to Bainbridge Island last Sunday. It was one of those rare winter’s days when the sky is brilliant blue and although the air is crisp with cold, you still want to get out in it. So we did. 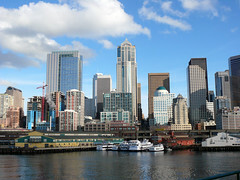 The ferry ride revealed much about Puget Sound on which Seattle is situated. With great appreciation we got our first glimpses of the Olympic Mountain Range, which lies west of Seattle. It is beautiful. I could use more clever superlatives, but it is a rocky, snow-capped mountain range, and when seen across the water, ‘beautiful’ is the perfect description. To the south is Mount Rainier, which on Sunday was not quite clear, but silhouetted against the milky blue of the southerly sky. It stands alone, about 70 miles from Seattle, and is a northwest Mecca for climbers. Once out on the sound, we looked back at Seattle and saw what is not wholly evident from being in Seattle looking out at the sound; it really is a spectacular-looking city. The skyline reflects the diversity of a multi-cultural city built on the back of rough, 150-year old industries, like logging and mining. The architecture is eclectic, with Art Deco-style buildings sitting beside strikingly modern circular and angled buildings. The restored dockside buildings are another contrast, fringing the city with colour and bustle. With the Cascade Mountain Range in the background, and the still waters of the sound (the deepest natural harbour in the world), Seattle is simply, a stunning city. Our attention was called skywards as we watched the giant seagulls soaring above the ferry, effortlessly, and keeping pace as though they were tethered to it. They flew in a formation more reminiscent of Top Gun fighter pilots than geese flying south. And once in a while, one would peel away from the formation, gliding past us, as though a surfer catching a great wave. A gentle flap or two of the wings and the same gull would be over our heads again at the front of the ferry. This whole dance was mesmerising, and we realised we were watching the sky for a good portion of the trip. I took some video footage that barely captures how ‘cool’ they looked. And that is the best way to describe them – just super cool. Bainbridge Island is a pretty spot. It is the closest of many islands that populate the sound. And I got the sense that it is populated by people who know full well that they live somewhere special. Lots of beautiful wooden homes out on the point looking out over Puget Sound back to Seattle. They are a 25 minute commute to downtown Seattle, yet they live in relative tranquillity and amongst the pine trees. If the town seemed lovely, but just a tad ‘smug’, well then I supposed there is good reason. We wandered up from the ferry, a little adventure really, because we knew nothing about the island beyond how to get there. Within two minutes we came across a wine store. It came to our attention because of the sign that said ‘wine tasting’ and ‘open’, which registered with our great love of wine, and our even greater love of tasting new wines from an unknown region – for free. We were the only ones in there when we entered, immediately we were engaged in an interesting conversation with a guy in his mid-thirties, who admittedly got into the wine business because of ‘alcohol’. He and his father had been consuming it in great quantities when dad mentioned that the wine store down the road was for sale, and they should buy it. And so they did. He was knowledgeable, if not a little arrogant, but perhaps that was the whole ‘I live on this pretty island’ thing. He talked to us about wines in the immediate regions – Washington and Oregon. I was fairly naïve about how good these wines were before I came here and tried them first-hand, but have been impressed with many, particularly the reds. I have also enjoyed the fact that, like Australians, these north-westerners, really know and love their wines. Even the corner stores here have a decent selection, and there is a large gourmet grocery store a few blocks from here (the apartment) that has a huge and varied collection. We browsed there the other day for a long while and left with three bottles. Now we just have to drink it – and the bottle of red that we bought from the unusual man in the wine store. The rest of the day on Bainbridge unfolded pleasantly. The wine man sent us to Café Nola for lunch, which was a popular pick. We waited about 10 minutes for a table, but arrived at the right time, because a dozen people followed us in and sat watching us eat, willing us to finish quickly. While we waited for our food, we watched the servings leave the kitchen and make their way to other tables: huge!! I was glad we had ordered fairly light, although the pancakes and bacon looked amazing. I am a little in love with American pancakes, and even more so, their waffles. NO OTHER COUNTRY IN THE WORLD DOES PANCAKES AND WAFFLES LIKE THE AMERICANS. There, how is that for a bold statement? It is true though, although that day we had salmon sandwiches. I have consumed my body weight in salmon here. It is so fresh and affordable, compared to back home. We strolled back down the main street via those little shops where you look but rarely buy – ‘lots of shiny things’ says Ben. Our last stop was the wine shop where we picked up the bottle Ben had eyed earlier and then we were back on the ferry, a little tired from our big day out. The cab ride to the apartment from the ferry revealed what I had guessed: the sun setting beyond Seattle on a sunny day is absolutely heart-stopping. It falls behind the Olympic Mountains, which stand resolute in a grey silhouette while the tendrils of red and orange mingle with wispy clouds. Nice. So, how much good food, good wine, breath-taking views and good company can two people take? Not much, because at the end of our mini-adventure we were pretty much shattered, and had a quiet Sunday night in with a simple salad, oh and a bottle of wine.